First lady Michelle Obama watches as Democratic presidential nominee Hillary Clinton speaks during a campaign rally last week at Wake Forest University in Winston-Salem, N.C. It was a show of feminist sisterhood: Democratic presidential nominee Hillary Clinton basking in a powerful glow joined onstage by current first lady Michelle Obama, who has achieved an almost regal status as Her Moral Highness of the American conscience in the most crass and divisive presidential race in history. This was last week, at a joint appearance in Winston-Salem, N. C., a moment that underscored the election's important discourse on gender and was also so much more. Obama called Clinton "my girl," a term that only this first lady, who has perfected a tricky blend of dignified comedy in her late-night television appearances, could use without people cringing at her attempt to be cool. Used as a seemingly authentic expression of support for a woman who was once a bitter adversary of the Obamas, it also, strangely, had the feel of maternal approval, which points to just how unequal these "sisters" are. Obama had to be Clinton's voice, speaking for her, like a good parent who will say what her daughter won't or can't in front of important company. It also had the feel of a queenly knighting ceremony, that Obama, in all her six-foot glamour, was draping Clinton's more grandmotherly figure with a hug and a solemn responsibility to carry on the legacy of the Obama era. Michelle Obama hit the campaign trail last week with Democratic presidential nominee Hillary Clinton. The current and former first ladies embrace during a rally in Winston-Salem, N.C. on Oct. 27. As her eight-year tenure as first lady draws to a close, Obama's public persona is a primer on how to win over a population as an engaged and modern political spouse – especially with the added challenge of facing racial biases – and a powerful example of the growing influence of (and restrictions on) women's voices in the political culture. "The secret to Michelle Obama's reputation is that she delivers emotional truths," says Peter Slevin, who wrote a biography of the first lady last year. The use of her as a surrogate for Clinton suggests the caution that remains for female leaders out of fear over violating entrenched stereotypes of feminine behaviour. Just as Obama gave the warm-and-fuzzy female affirmation of Clinton's candidacy, Elizabeth Warren, the popular Democratic senator from Massachusetts, expressed the angry-and-nasty voice when she stumped for her last month in New Hampshire. Both times, Clinton was sitting onstage, nodding her head, hands clasped on her lap, bound silently in her look-presidential straitjacket. "Powerful women are expected to be very pragmatic," says Jay Newton-Small, author of Broad Influence, How Women Are Changing The Way America Works. "Think of Angela Merkel or Margaret Thatcher. They're very nuts-and-bolts. They find it hard to show passion. Often, if they do, they're called shrill. It's easier for Michelle Obama to soar and get to 30,000 feet." Ironically, as a political wife, Obama is not seen as political, even though she has been. She is the perfect "closer" for the Democratic presidential campaign, the term used to describe her ability to put the cherry on top of her husband's re-election efforts, credited with bringing in the African American vote, in 2012. 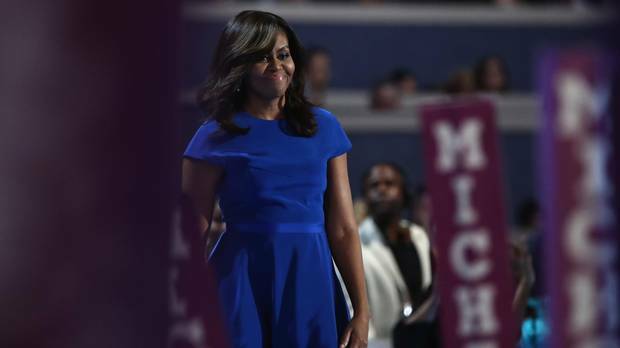 First lady Michelle Obama walks on stage before delivering remarks on the first day of the Democratic National Convention at the Wells Fargo Center, July 25, 2016 in Philadelphia, Pennsylvania. Perceived as above the fray, sincere and authentic, she is spending her valuable political capital while she has it. As Debbie Walsh, director of the Center for American Women and Politics at Rutgers University, notes, "Everybody is popular until you're a candidate," adding that Clinton enjoyed high approval ratings while first lady as well. Still, Obama has taken on the role with a noteworthy and shrewd grace (if there is such a thing), refusing, for instance, to use Donald Trump's name when she speaks about Clinton's opponent, as though not wanting to dignify him with her star-making attention. She has come a long way since the first – somewhat tentative – interview in the White House she gave to Oprah Winfrey, the safest possible conferrer of approval, for a cover story in O magazine in April 2009. They sat in the Yellow Oval Room with their shoes off on a comfy sofa, talking about pie and cushions and how to keep Malia and Sasha, then 10 and 7 respectively, from becoming princesses in the white palace. She was at her most scripted and packaged, wearing her safe, everywoman's attire of a dress and sweater that looked as if they'd been ordered from a Target catalogue. To further soften her image and to the chagrin of feminists, Obama had also given herself a benign moniker: Mom-in-chief. 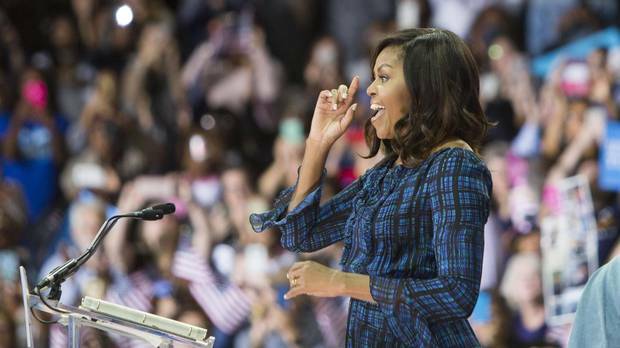 First lady Michelle Obama campaigns for Democratic presidential nominee Hillary Clinton at Lasalle University on September 28, 2016 in Philadelphia, Pennsylvania. It took until the Democratic National Convention this past summer, when she had nothing to lose and the benefit of enormous goodwill and trust from the American people, for her to say what she clearly felt at the time – that she was living the game-changing reality of waking up every day in a house built by slaves. That speech, the highlight of the convention, was her first endorsement of the party's presidential nominee. The freedom she has to speak her mind is the result of a strategic image campaign over the course of eight years. Some message massaging helped, thanks largely to political communications expert Stephanie Cutter. And there was coached smoothening of verbal tics, such as her tendency to utter an outraged "huh!" if she didn't like something, according to Newton-Small, who is a Washington correspondent for Time magazine. And Obama learned to focus on her greatest strength: her ability to offer "intimacy without revelation" as The New York Times once put it. Without seeming to overshare, she alludes to the struggle of growing up in a working-class family. In her powerful speech about sexual assault in the wake of the allegations against Trump, many intuited that she, too, had some personal experience of the problem. Rather than being self-regarding, she turns her own challenges into empathy for others, into a connection with the masses. In short, she has Oprah-fied herself. And to fulfill the unspoken first lady role of humanizing the President, who can be an aloof Mr. Policy, she offers harmless glimpses of domestic intimacy. He doesn't put his dirty socks in the laundry; needs reminding to make the bed; forgets to put away the butter after making his toast. His walk across the White House lawn is "very swagalicious" she quipped once, suggesting their playful sexual connection. But the gaze from other side of the bed and the public stage doesn't come off as sweetly fawning in the manner of some political wives who look on from the sidelines with small smiles and adoring eyes. There's a sense of an intelligent knowingness in her support of her husband. She doesn't seem shyly in awe of her husband's successful two-term presidency as much as affirmed in her appreciation of who he has always been as a human being. 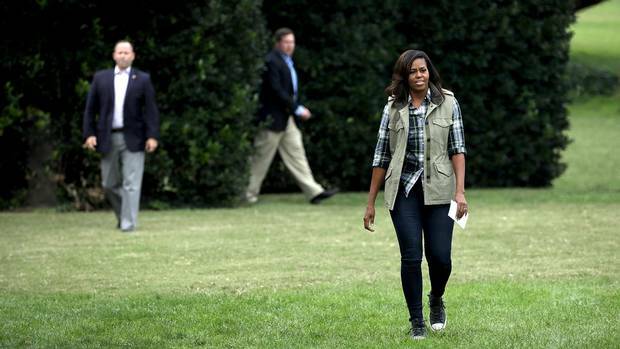 First lady Michelle Obama arrives for a harvesting event at White House Kitchen Garden on the South Lawn of the White House October 6, 2016 in Washington, DC. She also clearly learned from Clinton's early mistake as first lady not to appear too ambitious, even though she is. With her causes such as the White House garden project, healthy eating and her Let's Move campaign to fight obesity, Obama has cleverly dressed up a serious political agenda in mom jeans. The Healthy Hunger-Free Kids Act, signed by President Obama in 2010, was largely at the urging of his wife, says Newton-Small. And the undercurrent of her causes is broad: to help the disadvantaged and address issues of race, gender and class. She has also been able to advance a racial agenda. "She's not about saying, 'Don't see race when you see me,'" says Walsh. "She's saying, 'See race and see the multidimensional qualities of who I am.'" This first lady will leave a legacy, too.